Stonebridge, Saskatoon - We invite everyone to visit our open house at #212 - 410 Hunter Road on June 6 from 2:00 PM to 4:00 PM. Martensville, Greater Saskatoon Area - We invite everyone to visit our open house at 622 Klassen Crescent on March 22 from 2:00 PM to 4:00 PM. Willowgrove, Saskatoon - We invite everyone to visit our open house at 132 Shepherd Crescent on March 21 from 2:00 PM to 4:00 PM. The RE/MAX Fit To Sell program is designed to help you prepare your home so it sells faster and for a better price. As a courtesy to my clients I can provide a copy of the Fit To Sell package which includes a dvd with 10 videos featuring Carla Woolnough for viewing from RE/MAX of Western Canada. Preparing your home to be as presentable as possible is an important role you can play to ensure your home sells quickly and for the highest possible price. Is your home Fit To Sell? Click on the attachment below for a link to a video with some great ideas on getting your home ready to sell. 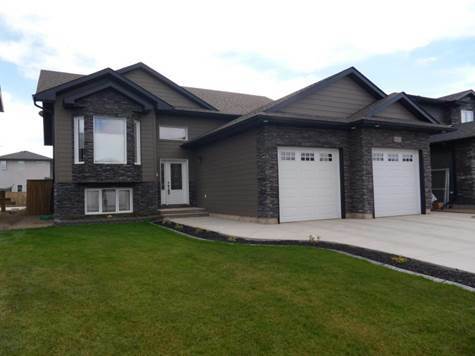 Pacific Heights, Saskatoon - We invite everyone to visit our open house at 3937 Centennial Drive. on March 17 from 1:00 PM to 3:00 PM. Warman, Greater Saskatoon Area - We invite everyone to visit our open house at 621 Thiessen Street on October 15 from 2:00 PM to 4:00 PM. • 1,470 sq. ft., 2 bath, 3 bdrm bi-level - MLS® $419,000 - Great Price! Warman, Greater Saskatoon Area - Desirable Location!! Walking distance to future middle school, elementary school, recreation complex, walking paths & located in a quiet area. This Gorgeous Bi-level with double concrete drive features a double attached insulated/drywalled garage with direct entry. It has great street appeal with a stone and siding exterior, concrete curbing forming flower beds in the front/back and a fully landscaped front/back yard. The backyard features a pressure treated deck with composite deck boards located off of the dining room through the patio doors and leading onto an exposed concrete patio. The rear yard is completely fenced in & has storage built in under the deck. Home has many upgrades; High efficient furnace with van-ee air exchanger, central vacuum with attachments, central air conditioning and humidifier. The basement has insulated concrete form, drywall and electrical all complete. ICF is actually to the roof. 9 foot ceilings on main and basement. The Kitchen, living room, dining room and hallway feature luxury vinyl tile. The kitchen island has cupboards b/in, electrical outlets and a central sweep. The entrance features a large foyer with built in shelving in the foyer closet. The masterbedroom has a large walkin closet and a 4pc bathroom. Home is complete with stainless steel fridge, stove, b/in dishwasher, microwave and range hood fan. Also included are front loading samsung washer, dryer and all custom window coverings. Seller will complete railing on rear deck. Home professionally appraised at $425,000. Asking $419,000. Westmount, Saskatoon - We invite everyone to visit our open house at 1307 Rusholme Road on September 10 from 1:00 PM to 2:30 PM. Meadow Green, Saskatoon - We invite everyone to visit our open house at 338 Avenue Y South on September 10 from 3:00 PM to 4:00 PM.